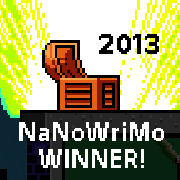 NaNoWriMo (National Novel Writing Month) takes place every November. The point is to write a novel in 30 days, which turns out to be approximately 1667 words per day. Hundreds of thousands of people participate in it, and every year I have said, “Maybe next year.” The truth is, I could never really see the point. I’m a professional writer with several published novels to my credit. It seemed as though NaNo was for people who had no discipline or needed something like that in order to get the job done. How many, after all, finished anything worthwhile? Well, this year, when I said, “Maybe next year” to my friend Pam Herber, she said, “You say that every year.” The gauntlet had been thrown. 1. I now have 2/3 of a poorly-conceived, messy, ugly, unwieldy first draft of a potentially good novel that I would not have had had I not participated in NaNoWriMo. I wish I had taken a week to prepare for my project, both plot and character, before the start of the challenge. 2. I had fun doing it, meeting friends in coffee shops to write together with headphones and caffeine. 3. I complained a lot because I didn’t get a Saturday or Sunday off, not even Thanksgiving Day, but I didn’t complain too loudly, because by Thanksgiving, magic was happening in the twists and turns and character development in my book. 4. I watched as my online NaNo “buddies” struggled with and overcame difficulties to also complete the challenge. Not all of them made it. 5. The pep talks the NaNo folks send almost daily are funny and insightful. Though I didn’t attend any regional events, they were frequent and looked to be a lot of fun. I might pop in on the Thank God It’s Over party tomorrow to accept my winner’s pin. 6. NaNoWriMo has writing events all year long. Darfinkle, my regional liaison, is going to give a presentation at the Wordcrafters in Eugene conference next March about NaNo and its camps and youth programs. 7. I read Chris Baty’s funny book, “No Plot? No Problem.” Chris is the founder of NaNo, and he might be more surprised than anybody about how well it has taken off. He has a lot of tips to writing a novel in this book and I found it to be a good read. Really now, what is the need in the world population that NaNo has filled? That is a question worth considering, because I think that over 600,000 people registered this year, from all over the globe. 8. My process of writing urgently, under deadline, was more than validated. For 23 years I held a series of weekend retreats where all participants were required to write a short story in 24 hours. Though many never believed they could do that, nobody ever failed. 50,000 words in 30 days is a little different, but the same idea prevails. So now I have a first draft to finish, reorganize, and polish. Will I do NaNo next year? Likely. If you do, “buddy” me so we can encourage each other on this crazy journey. It is a writing experience like no other. Highly recommended, at least once. I’ve been naming my years for a while now. 2009 was The Year of Hesed (lovingkindness).2010 was The Year of the Tao. 2011 was The Year of Living Simply, and for 2012, I’ve chosen The Year of Forgiveness. I’ve heard that to forgive someone means to merely allow them their path. Very simple, and my experience says that what is simple is best. Many years ago, I hurt a lot of people who got caught up in my tsunami of self-destruction. I am soul-sorry about that, and everyone that I’m aware of has forgiven me for my actions during those dark times, for which I will be eternally grateful. I needed those times; they were a part of my path to today. Surely I can allow someone else their path. I find that it’s easier to forgive someone the big transgressions, but what about the guy who cuts me off in traffic? I am usually outwardly calm, but in my head, I’m screaming: “You idiot!” I really don’t want to do that any more, so I’m going to stop it in 2012. I’m going to let the little things flow over me, making “allow them their path” my mantra for the year. And I’m going to forgive myself, too, on a daily basis, for being imperfect and doing all the stupid things I do. I say the wrong thing all the time, I eat the wrong things, I still am tempted to slide into old behavior patterns. I no longer burn with resentment, but I can chew on a good one for a while before letting it go. I don’t want to do that any more, either, and so I won’t in 2012. Forgiveness is sustainable; resentment is not. Living consciously is a decision. Each of us is faced with a million tiny decisions every day as to how to react to a million tiny situations. So in 2012, I will react with love in my heart and the perspective that while we all might be on different paths, the goal is the same. I have a good feeling about what 2012 has to bring. Today a student of mine called to say that she just sold her novel to a major New York publishing house. She was having a celebration and would I please come. Ah, the rewards of teaching. As a published novelist, I know, like perhaps nobody else in her immediate universe, what it means to get a book contract. I know the heartache and the angst and the Himalayan-size obstacles to overcome to get a good story down in 120,000 words, find agency representation and get a publishing contract. I can celebrate with her on a sub-atomic level. And I will. The interesting thing to me is that to her, my novel writing classes are all about her story. She focuses on her story, she works on her story, she does the homework using her book as her class project. And so it is with all of my students. To them, the class is all about them. But I know the truth. I am the teacher, and as much as they think they learn in my classes, nobody learns as much as I do. My goal is to light their fire, to give them a taste, to prod them to learn more on their own. But they each challenge me every single day to new insights about my own craft. I’m sure they think that after many books and short stories and more than a decade of teaching the basic elements, I know everything there is to know about the craft. But writing fiction is more than craft; it is engaging in fearless, relentless introspection, and there are always more layers to peel back, more depths to plumb, more insights to be had. And always, new techniques to try. One of the things a fiction writer must study in depth is the motivation of their characters, and while the characters I devise are not me, they are of me. Their motivations come from thoughts, feelings, attitudes, longings and imaginings I’ve had. So then, one must ask now and then, what is my motivation for doing what I do on a daily basis? Why do I teach fiction? First, and most obvious, I enjoy hanging out with other writers. Many of those who take my classes don’t even consider themselves writers because they’re either not published or they’re not accomplished, but being a writer is more than that. It’s a state of mind, a curiosity of being. I can be my socially-inappropriate self with a bunch of other social inappropriates. It’s fun. Second, it’s their job to challenge me, and they’re very good at it. When I stand in front of a class, I set the tone. If I’m enthusiastic and animated, asking questions and giving meaty information, they’re taking notes like mad, having insights about their own books and their own selves, and the questions start to come. Many times I can see they’re surprised by their own questions. Many times they begin by saying, “I’m not sure how to phrase this,” or “I don’t even know what it is I’m trying to ask,” and then they go on to ask a question that gives me pause and makes me search the mental databank. Many times I’ll alter whole areas of my syllabus because of one student’s question. Many times I’ll go home and try out what they were asking about, to see if it works, to see if it’s valid, to see if I can do it, to see if it makes sense. Invariably, it does. And when that happens, I give a hoot and scare the dog, and my craft has just taken a monumental leap forward, out of my practiced tedium and into new unexplored areas. So I’m going to go have coffee and cake with the Woman of the Hour, the new author, and I will hear her give me some kind of credit—but I know the truth. The credit all goes to her, because she is the one who made it happen. I just let her teach me about it on her way. …is now in the history books. I have to say, this was perhaps the best weekend with the highest quality stories across the board. Everybody really rose to the occasion. You’ll be reading some of those stories in magazines soon, I expect. And now we turn our attention to Science Fiction Story Weekend this fall, perhaps in a new venue with accommodations more befitting our advancing ages, and the next Ghost Story Weekend next Spring, God willing. I’m asking each of us to take a moment and consider how much our votes count. I don’t mean the ones on election day, I mean the votes we cast every single day with our dollars, our television remote control, and our mouse clicks. When we click on the ridiculous stories bandied about by voyeuristic internet sites to ogle the photographs of celebrities when they are trying desperately to live normal lives with their spouses and children, we are putting money in the pockets of the paparazzi that haunt their every waking moment. When we watch a stupid television series, we are telling the producers and the advertisers and the networks, that we not only approve, but we want to see more, similar idiocy on our television sets. Don’t you think there is too much idiocy on our television sets and not enough quality? Vote with your remote control. We vote with our dollars every time we go to a movie at the theater or buy an artery-clogging Big Mac or something cheap from China. If you want Americans to have jobs, buy American goods. If you want quality television, don’t watch trash. Read a book instead. Don’t fall into the trap of feeding the media frenzy on ridiculous stories that invade privacy and promote mindless speculation. It’s up to us if we want to hold our country to a higher standard of… of everything. When we say “America’s going down the tubes!” Well, guess what? We’re America! You and me. We can become a more compassionate country by being more compassionate ourselves. We can be more involved parents by not leaving the entirety of our children’s education to the schools. We can demand better television programming by not watching the “least objectionable” show at the time we want to flop on the couch, or politically incendiary rantings. We can become better people by making better, conscious decisions on what we buy, what we wear, what we eat, what we watch, what we view on the internet (and what we pass along), and how we live our lives. We need to take control of ourselves. We need to live our lives as examples to the next generation. We are role models, each one of us, whether we signed on for that job or not. We can’t just blame our elected officials for leaving a mess for future generations, we’re doing a fair job of it ourselves. So I ask you today: make a difference. Speak only with great purpose. Act mindfully. Behave as if your vote counted, because it does. In November, I’ll be teaching the four-evening Kick Start Your Novel class in Eugene, Oregon. This series of four classes is an intensive, hands-on novel-writing workshop designed to get your novel going in the right direction. Classes are structured so you will learn about the internal structure of fiction and the key aspects of writing a novel, then you will work on your book in class. This workshop is for the writer who has basic writing experience, is highly motivated and has at least a nodding acquaintance with the novel that dwells within. While you may work on a novel-in-progress if you insist, I strongly suggest that instead, you work on something fresh for the purposes of this workshop. Leave your old work at home and let the spirit of the moment move you. Trust the creative process and watch the magic happen. Trust me. I’ve taught this class many times, all over the country. I know what kind of magic we can conjure up. Plan to attend all four sessions, and spend non-class hours working intensively on your book as well. Momentum is important. This class is not for the faint of heart, the weak-willed or those who are afraid of the intense internal examination that novel writing entails. Your level of expertise is not as important as your dedication to the process. The class will take place over four consecutive evenings, 6pm-9ish November 9, 10, 11, 12. Space is limited to six participants. Come with your writing materials, an open mind and a willing heart. You will be amazed at what happens. For more information, or to register, pop me an email. I’ll be teaching Science Fiction Story Weekend at the Oregon Coast on October 23-25 this year. 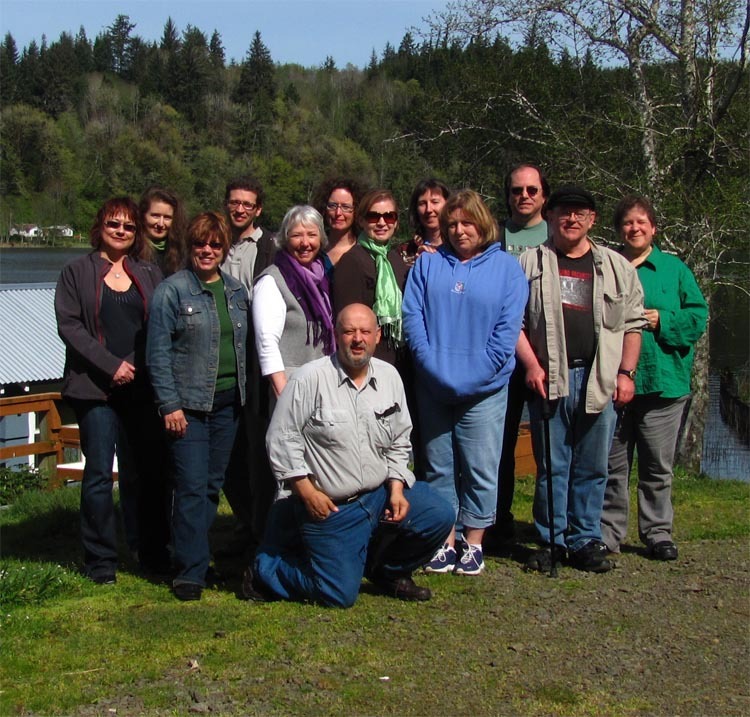 A maximum of thirteen of us will gather at the mysterious Siltcoos Station for a weekend of speculation and writing of outlandish, otherworldly stories. We’ll engage in world-building and species-building exercises and then write a complete short story in twenty-four hours. Tuition includes instruction in the short story form, particularly science fiction, lodging and simple pot luck meals. This workshop will be based on the format of the amazingly-popular Ghost Story Weekend that I hold every spring. We eat well, we write like fiends and we always make sure there’s time for long walks down the train tracks or country lanes, and for laughing together as only writers can. This is a Lane Community College class, offered fall term, and will only appear in the Florence campus catalog. Registration opens September 4. Section CRN 23262 includes lodging ($117) and Section CRN 23262 assumes you’ll sleep somewhere else (a shame, really) for $73. To register, click here. Please join us. You might be surprised with what you write.